What to choose so you can come out the winner. 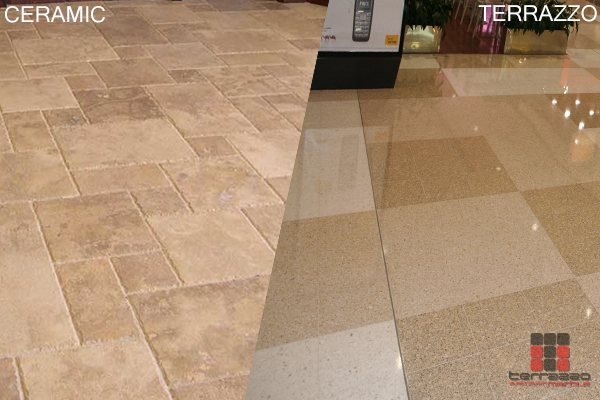 There are two popular choices for flooring systems – terrazzo and ceramic tile. This article aims to show the difference between the two, both their pros and cons, to help you in choosing which flooring system is better for you. Ceramic tile is considerably more affordable than terrazzo flooring across the board. In most cases, you can source ceramic tiles for as low as $1.00 per square foot whilst terrazzo is estimated to cost anywhere between $10 and $50 per square foot. Terrazzo flooring system is considered the more expensive choice however, when you consider that terrazzo far outlasts ceramic tile, you will be able to save far more in terms of maintenance, repairs and restorations. Ceramic tile has a wide variety of colors and sizes to choose from which allows you to customize the design you want to lay out for your floor. However designs are limited to a geometrical nature as most tiles come in squares with only thickness and size as variables. Terrazzo flooring is extremely customizable with limitless design options. In fact, you can create just about anything with terrazzo including but not limited to logos, art design, colors and patterns especially if installation is to be done in situ or on site. Ceramic tile, because of its shape can be easily installed and can be done by almost anyone. Most DIY-ers prefer ceramic tile mostly because of ease of installation. As it can go any area provided it is leveled and there are no curvatures to the surface area or edges. Terrazzo flooring is a bit more complicated to install and therefore needs to be done by tradesmen that are trained in the craft which is a factor to its higher pricing. This is especially true when it comes to the more complex designs previously mentioned. Ceramic tile is quite easy to maintain and care for except for the fact that ceramic tile has grout which can get stained and chipped. Terrazzo flooring’s solid surface allows for easy care and maintenance with no grout to worry about. Ceramic tile has come a long way when it comes to durability and in most cases, comes with a 25-year warranty. However ceramic is still easily cracked on occasions when heavier objects are accidentally dropped on it or when the surface area where your structure is built on shifts. Terrazzo flooring is well known for its durability in fact, there are terrazzo floors constructed hundreds of years ago that are still intact to this day and because of the way it is constructed, staining and discoloration is not as much of an issue. A designer’s favorite word is options. When conceptualizing a design build, designers opt for materials and resources that can deliver them a wider range of options which is always an advantage to you, their clients. Not everybody obviously have huge budgets when it comes to renovations or from-scratch constructions so the ability to work with materials that are versatile, durable and budget-friendly is a must. Terrazzo meets all of these requirements and then some. Because Terrazzo is a composite of different aggregates, it is very easy to manipulate the final design outcome. Designers and builders everywhere have all attested that design flexibility is the primary reason why terrazzo is their foremost material of choice. Additionally, terrazzo is not just for floors anymore. These days, terrazzo has been used as countertops, 3D wall installations, dividers and many more design components, indoors and outdoors. 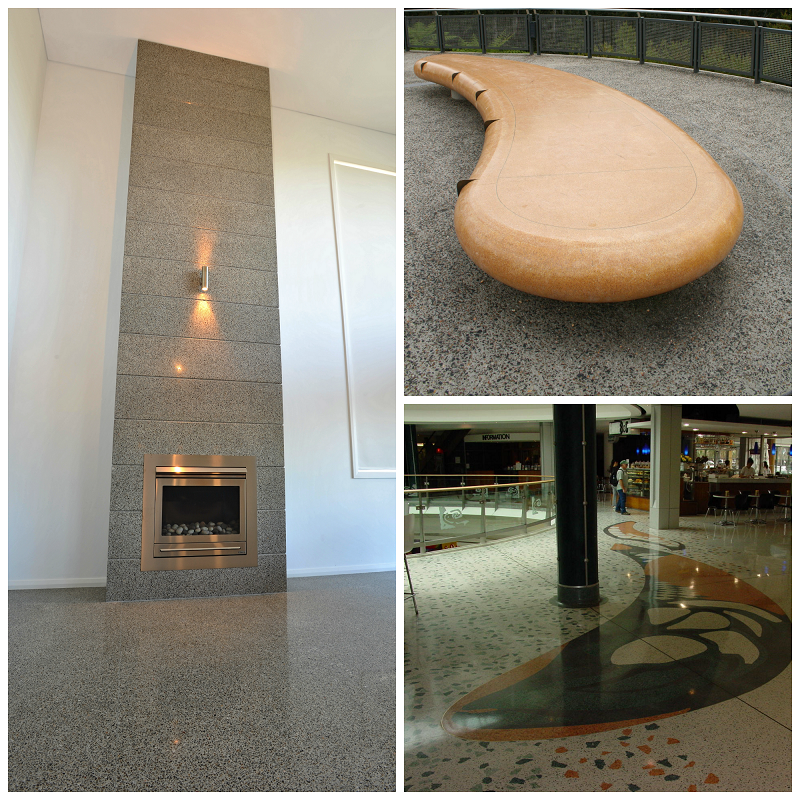 Durability speaking, terrazzo has proven itself heads and shoulders above other materials. Terrazzo has been around for decades, first appearing in the early 15th century. It is so durable that some of the original floors built around that time still exist today. Furthermore, maintaining terrazzo is a breeze. There are some instances where homeowners were lucky enough to have discovered floors under bad hardwood or rotting carpet and have taken to restoring them instead – another thing it is preferred – the ease to have it restored. And it doesn’t take much to restore terrazzo; which is one more feather in its already overflowing cap. Terrazzo as a building material ultimately has a lot of benefits that cover everything from design flexibility, versatility, durability and cost effectiveness in the long run. Designers know this, builders know this. Don’t you think it’s about time you know this too? Are you getting tired of your terrazzo floors? Do you want to change the overall color scheme of your living space and need your terrazzo floors to complement its new surroundings? Before you think of taking a sledgehammer to your floors, consider going the staining route. Color staining is the process of using a special liquid to change the color of an object by suffusing it with a different color permanently. Why staining? Why not painting? Painting may not be the most practical solution as paint tends to chip or flake off which is why it certainly is not the best choice for changing your floor color as the wear and tear will definitely affect the paint poorly. 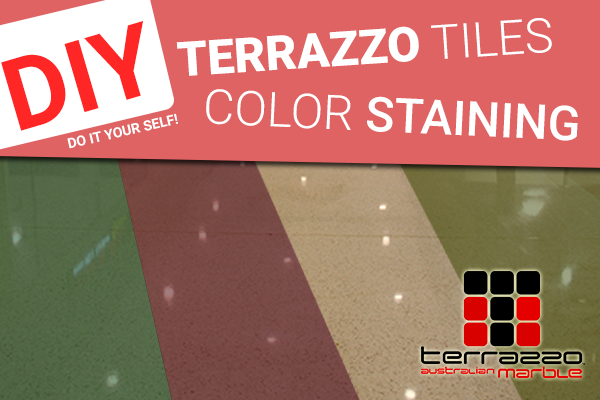 So what do you need to consider before color staining your terrazzo floors? First is product choice. You need to choose a product that works best with concrete floors. Concrete stains come in a variety of colors. Choose the best one that complements the marble on your terrazzo floor. However you might also want to consider colored epoxy which is applied like you would apply paint but can withstand the wear and tear to your floor more than paint. Before you start the actual staining process, ensure that your floors are debris free. Any kind of wax needs to be stripped from the floor surface before it is swept thoroughly to get rid of dirt and debris then mopped with a solution that’s equal parts soap and water. Once you’ve made sure your floors are debris-free, you can proceed to the next step – acid etching. This step is important because it ensures that the stain penetrates the floor deeply by “opening up its pores.” To prepare an acid etch, mix 1 part muriatic acid to 10 parts water, apply sweepingly to entire floor area with a mop, leave to dry then rinse with cold, clear water. Note that you have to wear safety goggles and a respirator mask to avoid inhaling the fumes. Next comes the actual staining. Make sure that the staining solution is mixed with just a small amount of water and brushed onto the floors with either a wide paint brush or roller. Do this by sections, map out a grid if needed. Once all the sections have been stained, you need to burnish the stain onto the floors until it has completely penetrated the cementitious part. Rinse with water once done before moving onto the next section. Let everything dry and then with a vacuum, remove all excess specks of the stain before the final process, sealing the stain, is done. Ensure that you use a wax specifically made for terrazzo floors. Apply accordingly and completely then take a step back and admire your newly stained terrazzo floors. More often than not, when you purchase a home from another family, there will be aspects to the original structure that you would want changed. If you inherited a home with existing terrazzo floors, do yourself a favor and learn about its pros and cons before tearing the entire floor up. Terrazzo floor installation is a bit on the pricey side so to have it already come with the house you bought is definitely a plus on your side. Getting it torn up and replaced should only be your last resort. Older terrazzo floors which have become a bit lackluster can be revived with just a thorough cleaning and re-polishing. Additionally, terrazzo is known for being able to withstand years of wear and tear without needing constant maintenance and can preserve its newly-installed look for a very long time. However, many argue that terrazzo floors can look somewhat unwelcoming and utilitarian. Therefore, knowing what can be done to make your inherited terrazzo floors work with your taste is important. There are many decorating ideas that can be done to actually accentuate your terrazzo floors without destroying or overshadowing its natural finish. These days, terrazzo can be stained to give it a different hue that works with your preferred color palette. Staining can be a completely DIY project or you can leave it to the experts. It’s all up to you. However, if you’re set on changing your floor completely, covering is a cheaper and smarter choice. Ceramic tiles, hardwood flooring and carpet work well in covering terrazzo floors and down the road, if you change your mind, you can always remove the covering and revert to your inherited terrazzo floors. Currently one of the more popular types of terrazzo, epoxy terrazzo is potentially the type with requires the lowest maintenance. And it is also one of the more versatile types as it can be used for both flooring and counter top installations. Add to this, the flexibility for design customization is almost limitless – in terms of color combination, the aggregate materials that can be added. One setback of epoxy terrazzo is that is not advisable for exterior use as it is unable to withstand the harsher weather conditions; otherwise, it makes for stunning interior countertops and flooring. This type of terrazzo is particularly preferred for areas with high foot traffic like malls, airport terminals, universities because of its durability and the fact that it’s cost-effective and versatile, design-wise. Preferably, during installation of cementitious terrazzo, weather conditions have to be suitable to ensure that no cracks are formed as a result. Extreme care should also be taken in mixing, laying out cement terrazzo to ensure that the installation would last as long as 60 years and onwards. Much like epoxy terrazzo only more suitable for exterior use because of its smooth and marble-like surface with a rough surface added as a means to increase slip resistance. Rustic terrazzo can be found more commonly in outdoor areas of hotels, malls, museums, townhouses and most commercial establishments with water features like pools, fountains and man-made waterfalls. The most prominent characteristic of this type of terrazzo is its basic construction. When used as flooring, it is made up of different layers of material – such as wire meshes or reinforcing, isolation sheets and layers of sand. This is to allow for minor defects whilst preventing mirroring on the surface which makes it perfect for incorporating designs such as logos and works of art with multiple colors.